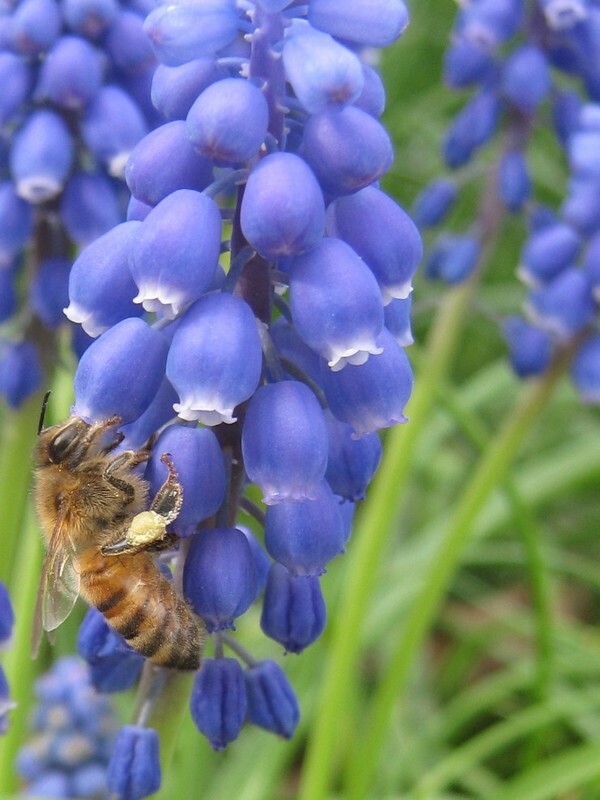 I’m not all that fond of the grape hyacinth. The color is nice, but plant one and the next thing you know, you have thousands. Not only do they flop over at the end of spring, but resprout in the fall with more messy leaves that flop over. On the plus side, the blue seas they form are great for bees. All day, there’s at least two or three honeybees and bumblebees darting between flowers. And look at how much pollen this honeybee is gathering! You’ll have to take my word for it regarding the bumblebees. As usual, they are moving too quickly for me to catch a good photo. The same goes for the little brown ground-nesting bees. And yesterday, I tried for a photo of a male Carpenter bee foraging in the blueberry blossoms. He looked ridiculous, this giant bee poking around little flowers. When I leaned in with my camera, he let out a very loud and very startled BZZZT! If a bee could say WTFGOAWAY! he was saying it as he zoomed out and buzzed my head. I went away.